Ernie Els did not fare well at the 1st hole at Augusta National this afternoon at the 2016 Masters. 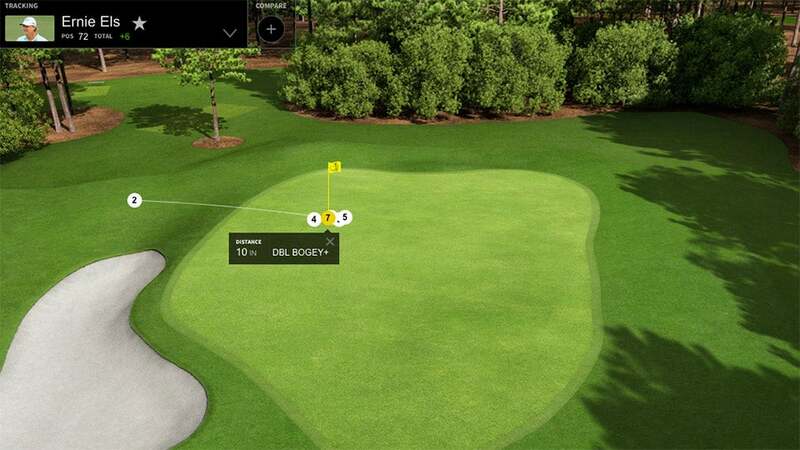 Tackling the first hole at Augusta National in the first round of the Masters is no picnic – the pressure alone is enough to undo many pros – but Ernie Els had the worst time in history this afternoon, carding a 9. That included a total of six putts within close range. After missing the green on his approach, Els chipped up and had a short par putt, which he missed. He circled around and missed a tap in that he also pulled left. The third putt is pulled left once again. Els then takes a break to collect himself, then pushes another short putt to the right. He reaches to tap it in one-handed, and the putt for 8 lips out. He gives a final shrug of the shoulders and taps in for a 9. Els has long struggled with a severe case of the yips. In January, he missed an 18-inch putt at the South African Open. In October, footage of another miss at the Alfred Dunhill Links Championship landed him in the unfortunate position of starring in a much-viewed YouTube clip of the mishap. But things had been looking up at the Dubai Desert Classic earlier this year, when he shot 68-67 in the opening rounds. He credited a different grip with helping to calm his "jittery" right hand. "I'm falling in love on the greens again," he said at the time. At Dubai, Els talked about the "deep, dark" place his experience battling the yips had brought him. Here's hoping that the Big Easy manages to climb out of the abyss again.